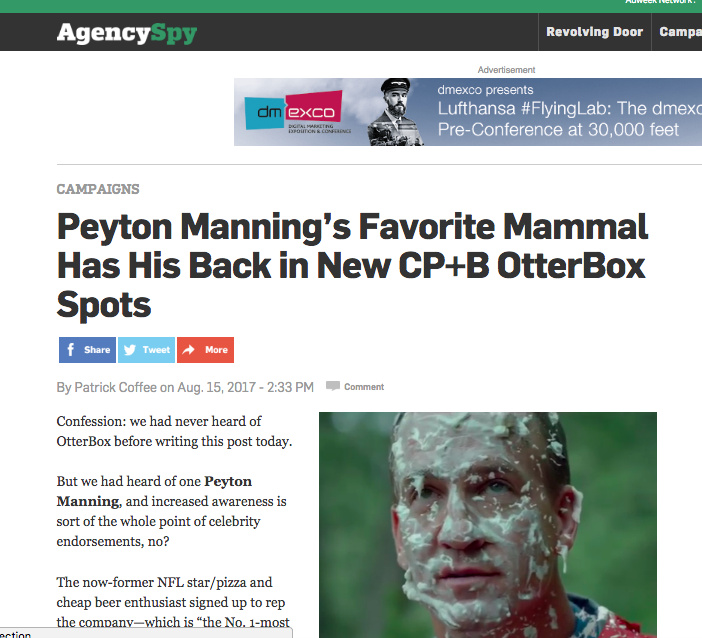 "As sports superstars go, Peyton Manning will go down in history as one of the most willing to look like a complete and utter goof for a laugh. Now the future Hall of Famer is back at his self-depreciating best with OtterBox. Can you picture Michael Jordan piggy-backing on a giant Otter like a toddler? Or Wayne Gretzky getting spraying the face with a fire extinguisher? Exactly." AND DID IT WORK? To-date the campaign has garnered almost 12 million online views, driven a 295% lift in brand interest, and is considered Best in Class according to YouTube brand metrics.Organic searches for “OtterBox” on Google.com and YouTube.com also increased almost 300%.